Getting from Newark Airport to Manhattan can seem confusing when you’re not familiar with the New York area. After all, it’s not often you arrive in an entirely different state from your final destination! 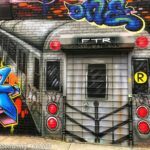 This detailed (written-by-a-local) guide will help you decide the best way to get from Newark to Manhattan with all the step-by-step info you need. Save this guide for later! Pin it. Just for some clarity and context, Newark Airport (EWR) is about 17 miles from midtown Manhattan. 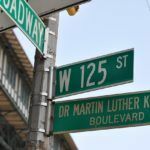 While Laguardia is the closest airport to Manhattan mileage-wise, it doesn’t always translate to quicker transfer times into Manhattan or to your NYC hotel. 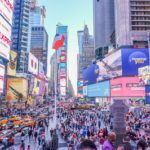 Depending on the day and time you arrive and the way you choose to travel from EWR to Manhattan, the trip can take about half an hour or well over an hour. 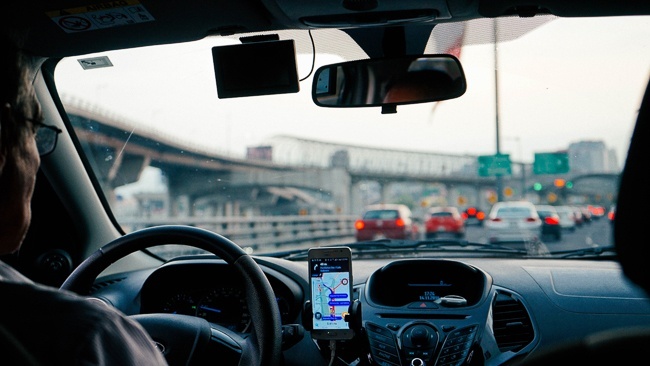 Choosing the right means of transportation for your situation, travel style, and travel budget can make all the difference between arriving at your hotel frazzled or not. 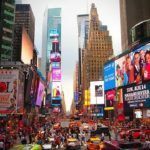 If it’s your first trip to New York City, a taxi or private car is undoubtedly the easiest way to transfer from Newark Airport into the city. Newark Airport has taxi stands at every terminal and posted signs to show you the way. Depending on where you’re going, a taxi from Newark to Manhattan can cost between $50-$75, not including tolls and possible surcharges for oversized luggage. The local taxi commision will also add a surcharge of $5.50 for credit card payments. An Uber taxi from EWR to Manhattan, as well as other taxi app services, are also available from Newark Airport. Prices fluctuate depending on the time of day, demand, and the type of ride you select. You can also pre-arrange a car service which can be helpful in avoiding long lines at the taxi queue. In particular, this could be a good way to go if you’re traveling with a family or group of more than 4 people and need a bigger vehicle. A cab from Newark to Manhattan is undoubtedly the most expensive New York airport transfer. If you’re looking to keep costs down, keep reading because one of the options below will be a better fit. 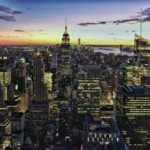 Go Airlink NYC is an official partner with the New York and New Jersey Port Authorities and has earned a reputation among NYC hotels as the most trusted New York airport shuttle. An NYC airport shuttle is a cost-friendly and environmentally-friendly way to transfer between EWR and NYC because you’re sharing the ride with other travelers. Shuttles can be booked in advance and your driver will track your flight and wait should there be any delays. You’ll get door-to-door shuttle service to and from your Manhattan hotel no matter when you arrive because transportation from Newark Airport to Manhattan is available 24/7. 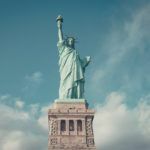 If you’re looking to save some money but don’t want the hassle of figuring out the bus or train, the best way to get from Newark Airport to Manhattan is the Go Airlink NYC shuttle. Pro Tip: Go Airlink Groups & Charters is also great for bigger parties needing an entire SUV or van. Not only can everyone travel together, but the cost can also be split. Port Authority Bus Terminal (41st Street between 8th and 9th Avenues). The bus from Newark Airport to NYC is available from all 3 terminals with departures running every 15-20 minutes. Service is available from 4 am to 1 am. If your hotel is not near one of the above drop-off locations, you can access the subway from any of the stops listed above. You can also get a taxi or walk to your destination. 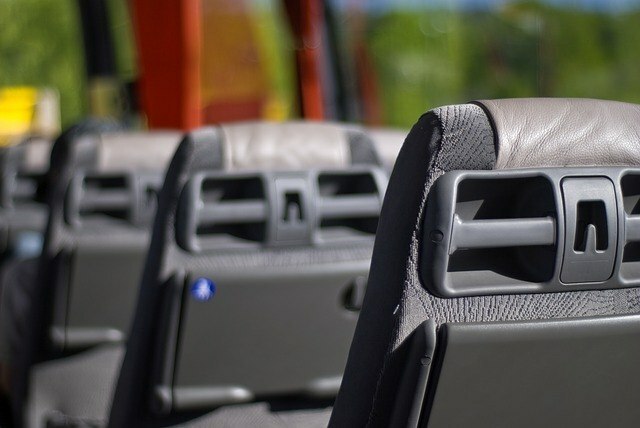 The express bus service and overall experience can definitely be hit or miss! There are no reservations for the express bus so you’re at the mercy of the amount of space the bus has for the number of people waiting to board. And as with all city buses, they tend to run late so plan accordingly and have a plan B, just in case. With a one-way express bus ticket costing $17 and a one-way Go Airlink NYC shuttle reservation costing $20, I’d book the shuttle. The reserved seat in a more reliable transport is worth the few extra dollars. AirTrain combined with New Jersey Transit trains are the most budget-friendly way to travel from Newark Airport to Manhattan. Not only that, you’ll stay off the roads and avoid traffic (A.K.A. saving your sanity!) which can be a major timesaver. The train from Newark Airport to Manhattan begins with the AirTrain, which is available from each of the three Newark Airport terminals, A, B, & C.
AirTrain runs 24/7 365 days a year and arrives and departs every 3 minutes from 5 a.m. to midnight and approximately every 15 minutes between midnight and 5 a.m.
From your terminal, follow the signs to the AirTrain, stopping at the orange and blue NJ Transit ticket machines at the AirTrain entrance to purchase tickets. If you plan to use the train for your return trip, you can buy a round trip now. The ticket you buy is for your complete journey on both the AirTrain and the NJ Transit train. Pro Tip: Save time and download the NJ Transit app to buy your tickets on the go. 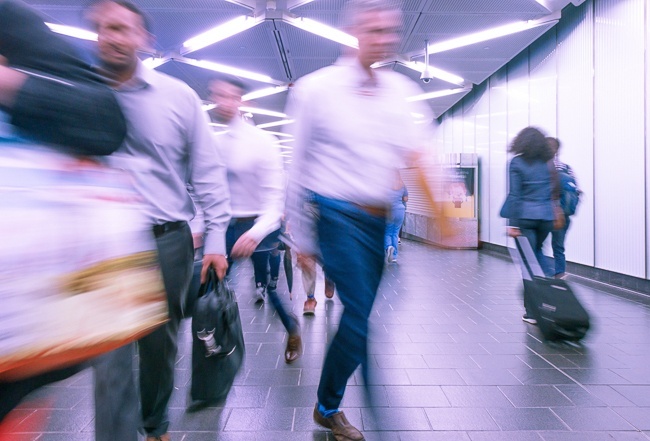 You’ll need to purchase a ticket to go to New York Penn Station, NOT Newark Penn Station, for everyone ages 11 and up. At the time of writing this, tickets were $12.50. 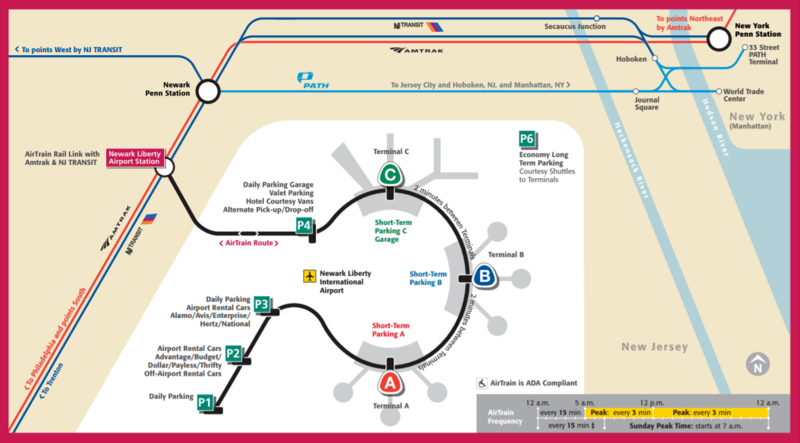 Head up to the AirTrain platform and take the train going to the Newark Liberty International Airport AirTrain station. The ride is not long, taking anywhere from 7-10 minutes depending on the airport terminal from where you started. 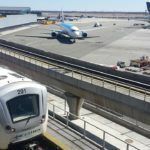 At the Newark Liberty Airport Station, get off the AirTrain and connect with the NJ Transit train going to New York Penn Station. Look for signs and screens directing you to the right platform. Make sure you get on the train bound for New York Penn Station, not Newark Penn Station. The ride to New York Penn will be about 30 minutes. Newark Penn takes about half that time. The train you’re looking for is an NJ Transit train, not an Amtrak train. Expect a train conductor to check tickets on board the NJ Transit train. The train is also likely to make a couple of stops but don’t get off the train until you reach New York Penn Station. Once you arrive at Penn Sation in New York City, access the NYC subway system or get to a taxi line for a cab to your final destination. Use the signs in the train station to navigate to the subway entrance or above ground to the taxi queue. Lastly, when considering travel from Newark to Manhattan by train, think about your luggage. The steps above are easily managed with a rolling suitcase or a single bag. But traveling with oversized bags or too many bags can make the above steps more of a challenge than they need to be. 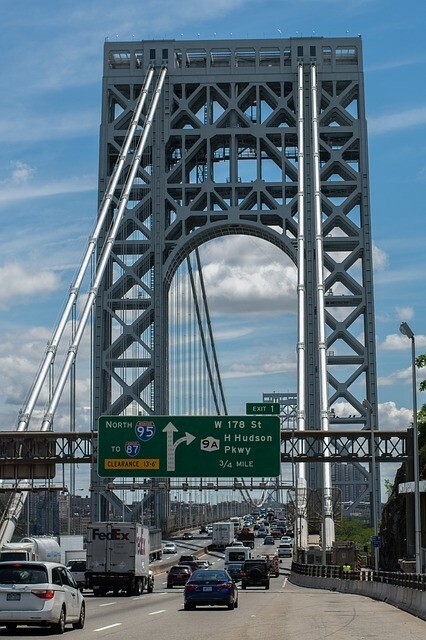 All of the above transportation options can also get you from NYC to Newark Airport at the end of your trip. It’s worth it to compare one-way and round-trip ticket prices to see if there’s a benefit to buying one over the other. Yellow taxis will take you passengers to Newark Airport. Some will try to set a flat rate similar to the flat rate price set by NYC for rides to JFK. Don’t accept. Per NYC taxi guidelines, trips to Newark Airport from New York City are metered fares. You’ll have to also pay for the round trip tolls, a $17.50 surcharge, and tip your driver for good service. Remember, any transportation relying on the roads is at the mercy of the traffic. 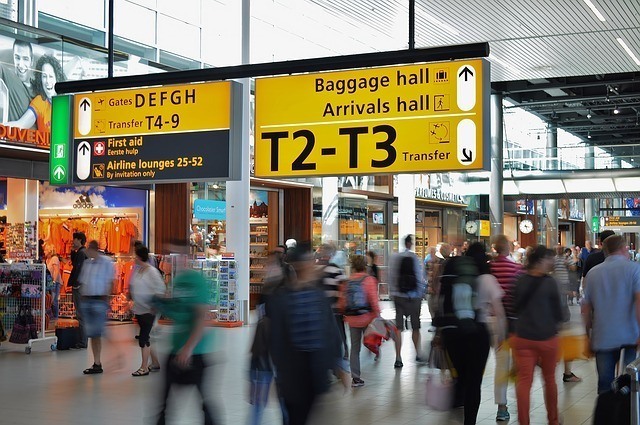 Depending on your flight time, be prepared and allow for plenty of extra time so you don’t miss your flight sitting in traffic. 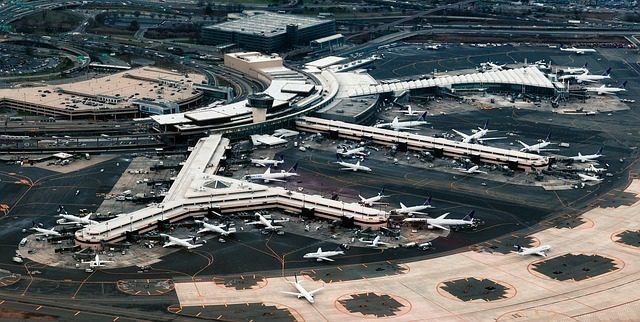 So, how do you get from Newark Airport to Manhattan? That all depends on your travel budget and your travel style. 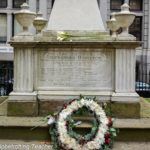 Going from Newark Airport to Manhattan by taxi or private car service comes with its perks, like not having to struggle with heavy luggage on public transportation. But, it’s also the most expensive. Taxis also have a limit to the number of people they can fit which may not work for big families. Public transportation from Newark to Manhattan is a great way to cut costs. The train also helps to bypass traffic which could be considerable depending on the time of day you arrive. If I had to choose between the train and the bus from Newark to NYC, I’d go with the train. You beat the traffic and, in my experience, the train is more reliable. The Go Airlink shuttle is a really great compromise for getting from Newark to Manhattan. 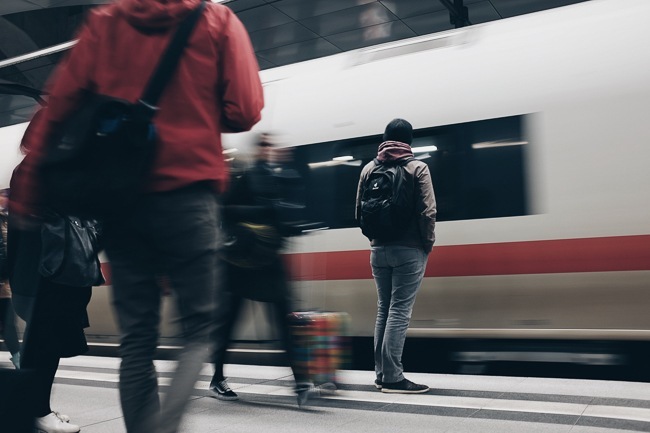 If you’re not comfortable with the steps for taking the train or your luggage makes this too difficult, you can save yourself the stress and hassle but also not spend the amount of money you would with a taxi or private car. 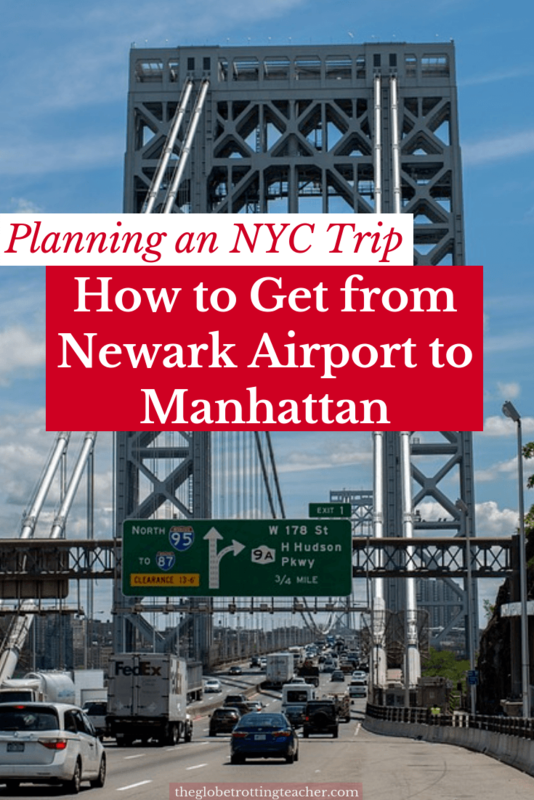 So, what’s your plan for getting from Newark Airport to NYC? Thank you, this was super helpful, and it was ranked #1 on the google search. I’m arriving @ 4, so traffic could be bad. My past experience with the train is that it’s somewhat a pain, with all the transfers & walking. A fun adventure, but time consuming. Thanks for reading, Jennifer. Arriving at 4pm is tough…lots of traffic. I’d highly recommend giving the train another try if you want to avoid rush hour. Enjoy NYC! Hi, so if you are renting a car in the Princeton area and driving in to NYC is there one way that is better than another in terms of tunnels? Thanks in advance. Thanks for reading, Francesca. The Holland Tunnel will bring you downtown to lower Manhattan. The Lincoln Tunnel will bring you into Midtown, near the theater district and Times Square. Depending on where you’re staying or visiting, one might make more sense. However, I recommend using an app like Waze to determine traffic and your best driving route. Waze will be able to detect if one tunnel is jammed or has an accident or something and try to reroute you. Enjoy your time in NYC!